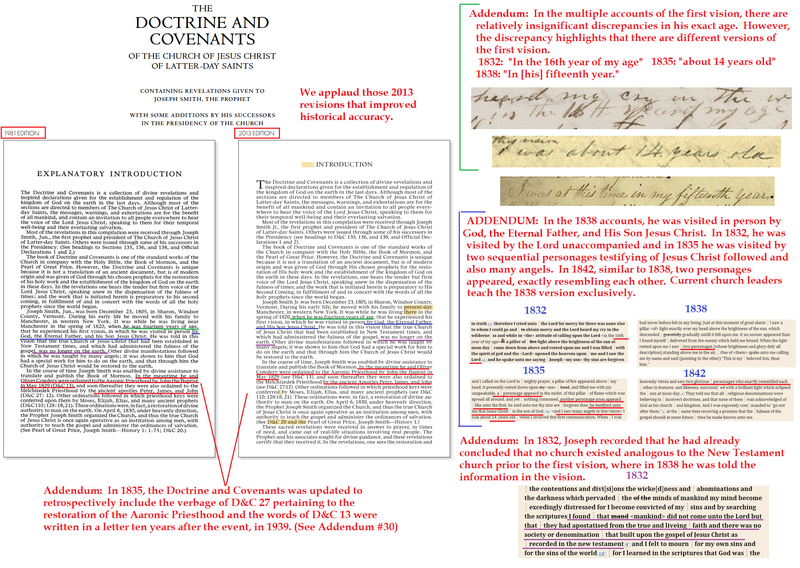 This entry was posted in Doctrine and Covenants Revisions, First Vision Accounts, Priesthood Restoration and tagged doctrine and covenants, doctrine and covenants introduction, Scriptures on July 23, 2014 by claytonbhess. 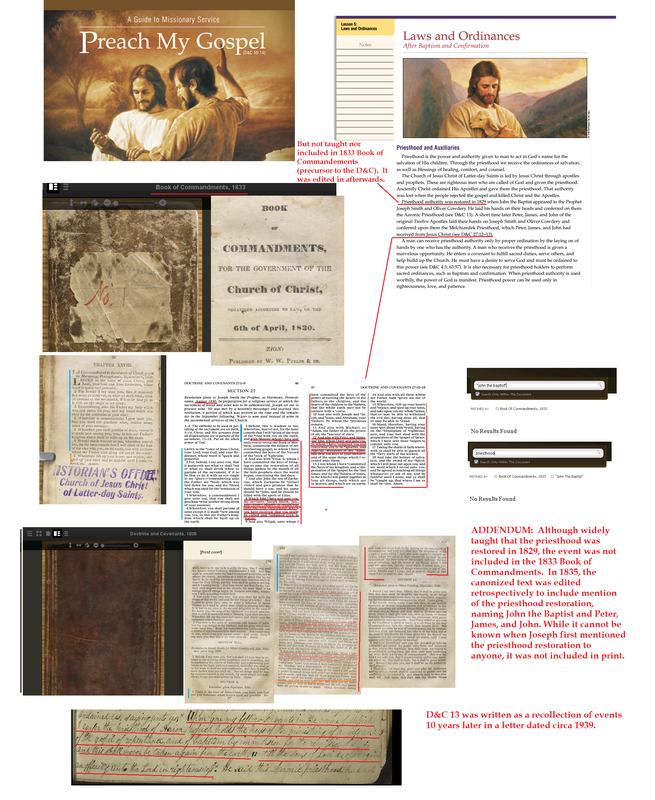 This entry was posted in Doctrine and Covenants Revisions, Priesthood Restoration and tagged Manuals, Missionary, preach my gospel, preach my gospel chapter 3 on July 22, 2014 by claytonbhess. 1. President Brigham Young guided the rescue of the Martin and Willie handcart companies. “I take you back to the general conference of October 1856. On Saturday of that conference, Franklin D. Richards and a handful of associates arrived in the valley. They had traveled from Winter Quarters with strong teams and light wagons and had been able to make good time. Brother Richards immediately sought out President Young. He reported that there were hundreds of men, women, and children scattered over the long trail. … They were in desperate trouble. Winter had come early. After admonishment from their church leaders that God would protect their party, hundreds chose to depart Nebraska in late summer, despite their knowledge of late departure and guaranteed unprotected travel through harsh mountain winter. Their leaders, “Prophesied in the name of God that we should get through in safety. Were we not God’s people, and would he not protect us? Even the elements he would arrange for our good.” Snow-laden winds were howling across the highlands. … Our people were hungry; their carts and their wagons were breaking down; their oxen dying. The people themselves were dying. All of them would perish unless they were rescued. “‘I will tell you all that your faith, religion, and profession of religion, will never save one soul of you in the Celestial Kingdom of our God, unless you carry out just such principles as I am now teaching you. Go and bring in those people now on the plains’ (in LeRoy R. Hafen and Ann W. Hafen,Handcarts to Zion , 120–21). “That afternoon, food, bedding, and clothing in great quantities were assembled by the women. The next morning, horses were shod and wagons were repaired and loaded. The following morning, … 16 mule teams pulled out and headed eastward. By the end of October there were 250 teams on the road to give relief” (in Conference Report, Oct. 1996, 117–18; or Ensign, Nov. 1996, 85–86). Point out that the Martin and Willie handcart companies had done all they could to reach the Salt Lake Valley, but they could go no farther. They needed to be rescued. Without the rescue parties, they all would have died. Addendum: It is important to emphasize the faith of the members of the Willie handcart companies. Numerous party members warned of the impending winter conditions and admonished the saints to stay in Nebraska for another season. Church leaders admonished party members to proceed onward, promising that they would be protected and safe from the elements . Opposing voices were reprimanded and silenced to minimize their influence. Meaning: From a secular perspective, knowing that church leaders advocated for a late summer departure and knowingly promoted the application of faith to oppose rationale fear of death and summering is extremely concerning. While is does not refute the appropriateness of rescuing the handcart company, it does call into question the appropriateness of priesthood leader influence and to what degree rationale thought should be supplanted by faith. From a faithful perspective, the death and morbidity of the handcart companies may be viewed as a necessary sacrifice resulting in a faith-promoting experience inspiring generations. 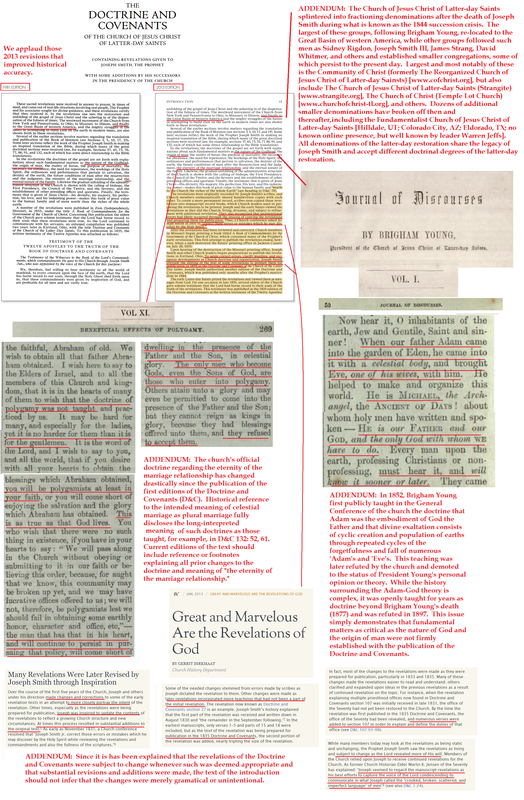 This entry was posted in Church History, Doctrine and Covenants Revisions, Leadership Decisions, Pioneers and tagged Doctrine and Covenants and Church History, Doctrine and Covenants and Church History Chapter 35, Manuals, Sunday School on July 8, 2014 by claytonbhess.